But the Bible, more than any other book, is also the most maligned on the market. Many of the cities of our culture dismiss the Word of God. 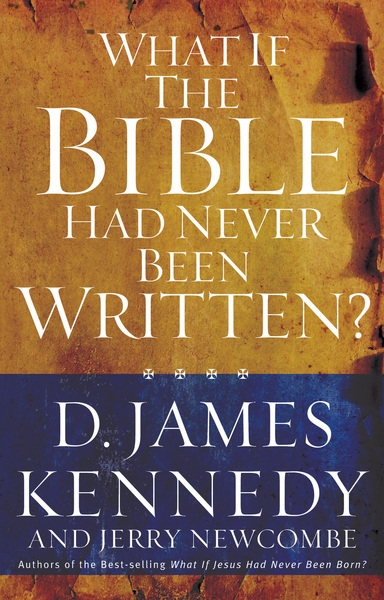 In What If the Bible Had Never Been Written?, D. James Kennedy and Jerry Newcombe show that this collection of books was indeed the inspiration for almost all of the great explorers, scientists, writers, artists, politicians, and educators the world has ever known. That such a book, which has influenced so many and stood the test of time for so long, is dismissed as folklore or myth, just goes to show what extremes nonbelievers will go to rationalize their behavior. From the Ten Commandments, which many of our laws and government are based upon, to the Golden Rule, a verse taken straight out of the New Testament, to many of today's most common phrases and expressions...there is no doubt as to the influence the Bible has on everyone, in some degree, every day. What If the Bible Had Never Been Written? provides a well-documented and in-depth look at the impact the Book of Books has had on humanity, pointing to specific areas in today's society that would not be as they are now, if it were not for the Bible.